In the northern suburbs of Fuzhou City, the Fuzhou National Forest Park is seven kilometers from the city proper, and has an area of 8.593 square kilometers. It boasts of its fascinating scenery composed of lush forests, peaks rising one higher than the other, and green waters. The August 1 st Reservoir is full of clear water all year round. The Maitreya, Pen Rack, Cockscomb, Cat's Head and Centipede mountains are vivid and powerful, while the Dragon Pond and Egret streams and waterfalls are very appealing. 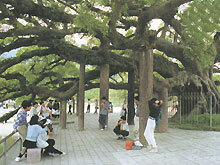 The park is home to nearly 3,000 species of rare plants from China and 36 other countries; and several special botanical gardens have been set up, such as the Sutie, Palm, RarePlant, Bamboo Appreciation, Tree Appreciation and Potted landscape gardens, as well as the Banyan Scenic Zone. 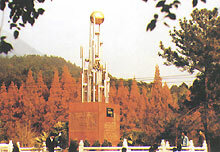 With a beautiful environment, scientific connotations and unique forest recreational projects, the national forest park is an ideal tourist and holiday resort for both Chinese and foreign visitors.